Square Enix has announced Final Fantasy XIV: Shadowbringers, the third expansion to the heroically revitalised MMORPG Final Fantasy XIV: A Realm Reborn. Following in the footsteps of Heavensward and Stormblood, the latest expansion will add a whole host of new content to the game when it releases in July. Details of Shadowbringers are slowly coming into the light as part of this year’s trio of FFXIV Fan Festivals. Now that Tokyo Fan Fest 2019 has wrapped up, we’ve updated this page with all the latest info and reveals. There’s still more to come, however: more information will be revealed in a media tour which is coming later this year. The basis of what we know so far, though, is that Shadowbringers will continue the game’s Main Scenario Quest with a story that sends players on a journey to become Warriors of Darkness. Considering that we’ve spent the entirety of Final Fantasy XIV so far as Warriors of Light fighting off forces of darkness, it must mean some serious stuff is about to go down in order for us to maintain the balance in the world. Part of that adventure will take players to the First World location of Norvrandt. This is significant as it marks the first time players will travel beyond the world of Hydaelyn, where the rest of Final Fantasy XIV has taken place. The latest trailer also reveals the return of Minfilia, a young girl under the protection of Thancred. A number of recurring characters have also undertaken new jobs or intriguing new titles for Shadowbringers. The list of other standout additions in Shadowbringers includes two new job classes, an increased level cap to 80, two new races, two new Beast Tribes and Primals, nine new dungeons, two endgame raids (including one based on Nier Automata), a ‘Trust’ system for NPCs, a host of new areas to explore, and a New Game+ mode that will allow you to replay previous storylines from the Main Scenario. It’s a lot to take in so let’s take a look at it all in more detail below. The Standard Edition will cost $39.99, €34.99 or £29.99. The Digital Collector’s Edition will cost $59.99, €49.99 or £44.99. Fran Minion and Revolver Gunbreaker Weapon. Sticker Cling and Final Fantasy XIV Playing Card Deck. All Shadowbringers pre-orders come with the Baby Gremlin Minion and Aetheryte Earring (which offers a 30% EXP bonus up to level 70). You’ll also get early access to the expansion, which is scheduled to begin on June 28, 2019. We’re expecting two new jobs to be added to Final Fantasy XIV with the Shadowbringers expansion. The first one, Gunbreaker, was revealed at the European Fan Fest in Paris. A few months later, Dancer was revealed as the second at Tokyo Fan Fest. The Gunbreaker is the master of the gunblade – a ludicrously improbable but effortlessly cool weapon most famously wielded by Squall Leonhart in Final Fantasy VIII. The job will sit alongside Warrior, Paladin and Dark Knight as the game’s fourth Tank class. While we don’t know any specifics about how the job plays just yet, a brief introductory video has shown off the class in action and a number of Gunbreaker skills. There’s an expected flurry of different gunblade attacks, plus a couple more defensive moves that generate shields and barriers of brief protection. With the Dancer’s rich history as a healer in Final Fantasy V and XI, many expected the Dancer to become the FFXIV’s fourth healer. Instead they will be a ranged DPS, alongside Bard and Machinist. We don’t have specific details on how the Dancer job will play, yet. However we can glean from the reveal trailer above that Dancer will use chakrams to combine ranged attacks with abilities that can buff or support the party. Essentially we expect them to play similarly to Bard. Shadowbringers will add the Viera as a new race to Final Fantasy XIV. This lithe and rabbit-eared humanoid race will be familiar to anyone who has played Final Fantasy XII or Final Fantasy Tactics Advance. Fran, who was one of the main party members in the former release, popped up in the recent part of the Return to Ivalice raid, suggesting that the Viera race would be coming to the game soon. Viera are a female-only race. Square Enix is also adding the Hrothgar race to Final Fantasy XIV as part of their third expansion. These fierce beasts share a few similarities to the Ronso from Final Fantasy X, including the horns we can spot in the reveal trailer. The Hrothgar will be gender-locked as a male-only race. At the Paris Fan Festival, we can glimpse two new zones you’ll be able to visit in Shadowbringers: the Rak’tika Greatwood and Il Meng. The first new FFXIV Shadowbringers location is a dense green forest full of spindly trees, old ruins, and thick bogs. The second is far more appealing as it contains a rich variety of strange and colourful flora, vast fields and lakes, and a grand looking building that looms over the area. At Tokyo Fan Fest in March 2019, a further three new locations were unveiled for Shadowbringers: the cities of The Crystarium and Eulmore in the First World will serve as important player hubs and key locations throughout the Main Scenario. The Crystarium boasts opulent glass dome structures surrounding an enormous crystal tower in the centre. Eulmore disguises its grand and lavish interiors amid the trash and ruins of a nearby shanty town. Then there’s Lakeland, a more open field area with room for quests, FATEs, monster hunts, and more across its vast plains. 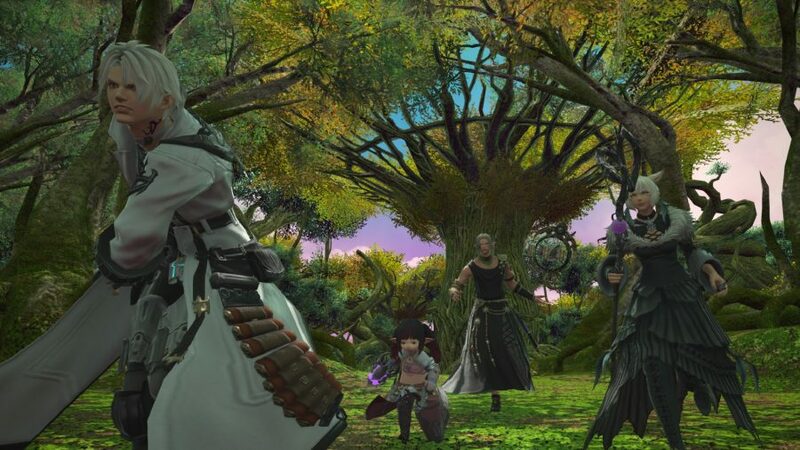 Final Fantasy XIV hasn’t been shy of hosting a collaboration event every now and then, yet it was still a huge surprise when game producer and director Naoki Yoshida announced that the new raid for Shadowbringers would be based on Square Enix RPG series Nier. Previous raid content, such as the Return to Ivalice series or the original Crystal Tower, has plundered the depths of Final Fantasy history for inspiration. However, this is the first time an outside universe will be part of the large scale 24-man raid. Entitled YoRHa: Dark Apocalypse, fans of Nier: Automata, in particular, should be very excited for the new raid as Nier creators Yosuke Saito and the enigmatic moon-headed Yoko Taro are both involved in the project. Nothing outside of their attachment to the raid and a single piece of key art has been released so far. Little of the Eden raid was revealed at Tokyo Fan Fest, but we do know that, like Omega and Alexander before it, Eden will represent the game’s hardest raid content for eight players. It also features a character designed by Tetsuya Nomura, who is best know as a Final Fantasy veteran and the director of Kingdom Hearts 3. Could we see more Final Fantasy XIV collaborations in Shadowbringers? 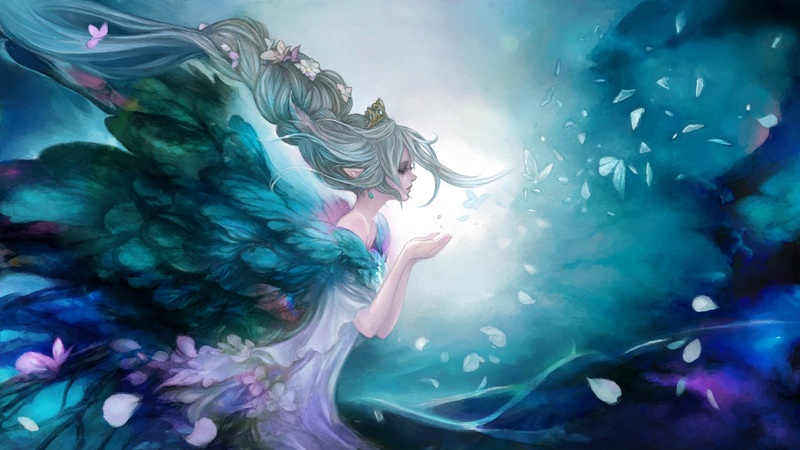 Each Final Fantasy XIV expansion usually comes with a new Beast Tribe or two and Shadowbringers is no different with the introduction of the Pixies and their Primal, Titania. Excitement at the reveal of two new FFXIV races at Paris and Tokyo Fan Fests was undermined by backlash against them only being available to one gender. 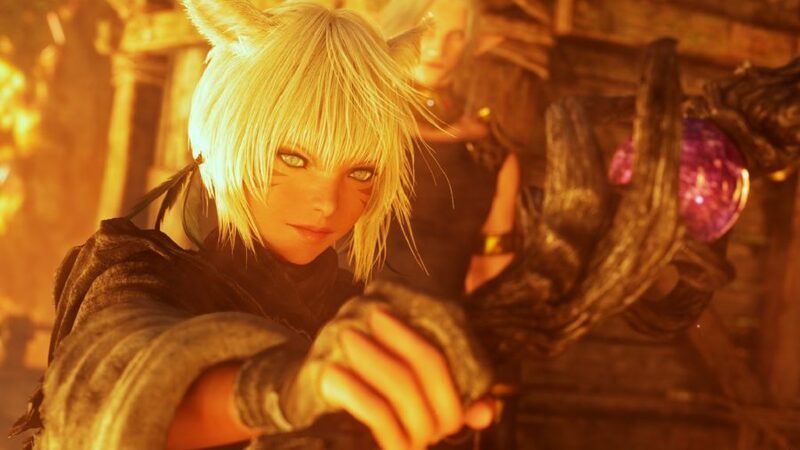 With male-only Hrothgar and female-only Viera coming to Shadowbringers we ask, why does Final Fantasy XIV still have gender-locked characters in 2019? As is always the case, the Warrior of Light and the Scions of the Seventh Dawn will have to step in once again when the Pixies gather up enough crystals to summon Titania. Before the Primal can unleash too much terror across the land she will have to be swiftly dispatched by eight players in a new FFXIV Shadowbringers Trial. Much like many of the game’s current Primal encounters, we can almost certainly expect that a tougher ‘Extreme’ version of the fight will be added to the game as well, where players will be able to earn high-level weaponry. The second of the expansion’s Beast Tribes, the Dwarves, will be found within the First World attempting to summon a Primal named Innocence. That may sound fairly benevolent for a massive magical being, but when you consider that they are also known as the “Sin-eater” it definitely sounds like a job for the Warrior of Light and pals in an eight-player Trial. Expanding on a number of ideas introduced throughout the Final Fantasy XIV Main Scenario Quests and Grand Company Adventurer Squadrons, Shadowbringers will allow players to team up with familiar NPCs and tackle instanced dungeons together. Details on this are still quite thin, but what’s been confirmed so far is that AI-controlled NPCs will be able to tag along into any of the nine, four-man dungeons from the Shadowbringers expansion. This means you might be able to bring along the likes of Thancred, Y’Shtola, and Alisaie into dungeons instead of other players. Going by the name (and the Custom Deliveries for crafters and gatherers already in the game), we would also guess that completing dungeons with NPCs successfully will increase your reputation with them. Doing so could potentially unlock a range of rewards including items, loot, and cosmetic gifts while also improving the skills and abilities of your chosen teammates. But that’s all speculation for now! We’ll add concrete info once more has been revealed on the Trust System.